Find this book at Amazon.com | buch7.de | eurobuch.com | buchhandel.de | books.google.com ASIN=0195178459, Category: Science, Language: E, cover: HC, pages: 376, year: 2006. If science has the equivalent of a Bloomsbury group, it is the five men born at the turn of the twentieth century in Budapest: Theodore von Karman, Leo Szilard, Eugene Wigner, John von Neumann, and Edward Teller. From Hungary to Germany to the United States, they remained friends and continued to work together and influence each other throughout their lives. As a result, their work was integral to some of the most important scientific and political developments of the twentieth century. They were an extraordinary group of talents: Wigner won a Nobel Prize in theoretical physics; Szilard was the first to see that a chain reaction based on neutrons was possible, initiated the Manhattan Project, but left physics to try to restrict nuclear arms; von Neumann could solve difficult problems in his head and developed the modern computer for more complex problems; von Karman became the first director of NASA's Jet Propulsion Laboratory, providing the scientific basis for the U.S. Air Force; and Teller was the father of the hydrogen bomb, whose name is now synonymous with the controversial "Star Wars" initiative of the 1980s. Each was fiercely opinionated, politically active, and fought against all forms of totalitarianism. 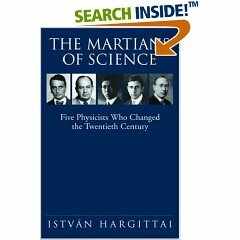 Istvan Hargittai, as a young Hungarian physical chemist, was able to get to know some of these great men in their later years, and the depth of information and human interest in The Martians of Science is the result of his personal relationships with the subjects, their families, and their contemporaries.